"How do we measure creativity, critical thinking, communication, or any of the 6 C's of 21st Century Learning without a clear understanding of what we are hoping to achieve?" The interesting part of this was that same week, a number of colleagues, including myself, were having the very same discussion in our attempts to plan our long term goals as a department. In chatting with both Tina & Matthew, and my own department, it became clear that there was a need to attempt to define each of the C's so that we can better our own professional development. Therefore the motivation was there, the need apparent, and the plan became clear - if a number of us tackled each of the 6 C's, perhaps we could come to a consensus/better understanding moving forward. Therefore, each week we will provide our own insights on each of the C's, and hopefully be able to apply them better in our own classrooms. So without further adieu, below is a collection of perspectives and opinions on the first 'C' - Creativity. It should be noted, that I've included each person's twitter contact, as well as a link to their individual blogs. Do check out each of their blogs as they provide their 6 word definition of Creativity (just like I do at the bottom); as well as provide a lot of great insight on a number of different topics. We are born creative, but do we, like Sir Ken Robinson claims, have creativity educated out of us? If creativity is something we value, how can we make sure schools do their part in valuing and teaching creativity? We can probably start by coming up with our own simple and workable definition for this surprisingly complicated word (if you don’t believe it’s complicated, take a look at the Wikipedia entry). Here is mine: making something new. This is easy enough to understand in arts classrooms, which are used working with creativity. 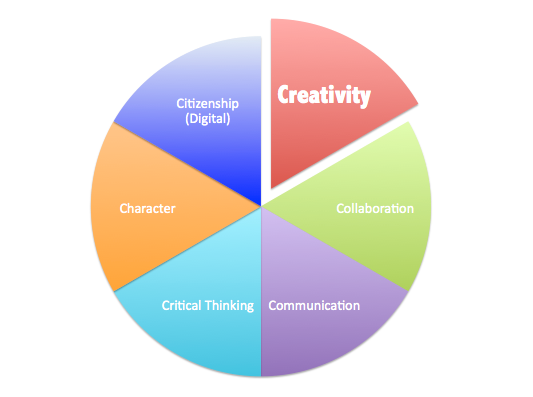 In other 21st century classrooms, what could it look like? Creativity is the process of combining knowledge, skills and imagination to produce something new that is relevant and has value. The definition of creativity in a teaching and learning environment also has to include the word relevant, since something can be ‘new or novel or original’ but if it has nothing to do with the assignment then it isn’t really valuable for that situation.. For example, if I assign a big idea assignment (in any subject, but lets say the History of New France) and allow the freedom of choice in presentation formats and I receive a “WOW! Original! Amazing! film with amazing special effects, all about kangaroos - it might be creative but it isn’t relevant to that particular history class. This student might become famous for their CREATIVE films, and decide that my history class wasn’t relevant, but it would not demonstrate knowledge, understanding, thinking, application, communication of the big ideas for this topic. Even if creativity is one of the hot buzz words of the moment, I find it completely mesmerizing. For a long time I equated creativity with being artistic and as someone who has two left feet, can’t draw much more than a flower and only sings in the safety of my car I found it hard to see myself as creative. As time progressed, the definition transformed and it almost became a badge of honour: a way to identify as being unique, thinking outside the box. Can everyone be creative? The fascination with creativity has taken over and the questions I have been contemplating abound. What is creativity? Is it nurtured or is it inherent in a child’s nature? What role does creativity play in success? So in an effort to better define creativity I thought of the most creative person I know (knew): my grandfather. He definitely broke the artist mold: he was not a painter, writer or artist and if you ever heard him sing ‘Here Comes Peter Cotton Tail’ at Easter in a thick Italian accent you knew his kids got their musical abilities from someone else. My grandfather was a garbage collector for the city of Toronto for over 30 years but his creativity was found in his luscious postage stamp sized Toronto garden. Like many Italian immigrants on the street he maximized every inch of his his space growing enough fruit and vegetables to supply the family for the summer and beyond (tomato sauce stock piled for the year). There were grapes over the walkway, herbs by the garage and beans across the back gate. My grandfather was recycling before it was cool, upcycling finds from the day like broken hockey sticks as plant holders or tool handles. He didn’t take climate as a reason not to have a delicious fig tree, going through the trouble of burying it every year. He did not accept the fact that having trees meant you could only have 2 fruits, grafting several trees together. As I reflect my artistic view of creativity has definitely gone and what remains is a vision of the possibilities. More than anything the creative individuals I have observed create new and amazing things from the ordinary, they maximize everything they have (time, resources, people). They look at a backyard, canvas, screen and see the possibilities.That is the lesson I want for my students. I have no idea what creativity means! But does anyone else? It is something different for every individual, and different across disciplines. I like to look at it from a bit of a marketing perspective however, as I find students have a better understanding from this perspective. Right or wrong, it what allows me to best explain it to students, and allows a framework to be set which can then be used for assessment purposes. In my mind, creativity is a projection of someone’s work in which it attracts attention, generates interest (makes you go wow! ), provides the necessary information in a consistent theme, and achieves stated goals. I liken it to an effective advertisement & the AIDA formula for marketing – Does it stop what you are doing to watch? Does it convey the necessary information (or interest you enough to go and find info)? Is it consistent in its imagery? Message? Pace? Etc. Does it make you desire the product? And lastly does it make you at least consider going out and purchase the product? The best, and most creative advertisements, do this. Does it make you go wow?! – It’s gotta stand out a bit. Creativity does not necessarily equal uniqueness, but uniqueness, I think is creative. Does it have all the necessary elements/concepts/info? – If information is missing then I don’t believe they’ve been creative enough in conveying information. Does it have a consistent theme – even something that is abstract, sporadic, or all over the place, can be consistent. Does it achieve goals? It has to fulfill it’s purpose, and what you want as a teacher. Creativity: Clear & Purposeful WOW! "So how do you define creativity? Do you agree with our definitions or disagree? We would love to hear from you."